I’m an avid fisherman, primarily inshore in the saltwater arena. The majority of my time is spent throwing artificial lures for inshore species such as trout, snook, and redfish. Being effective with artificial lures brings an entirely different appreciation for the equipment you are using. While many anglers choose to use live bait, the thrill of sight casting to a particular fish and watching him react and eat your lure is extremely gratifying. When using live bait to fish, most will simply cast out and hold the rod for an extended period of time. Often I will let “Rodney the rodholder” do the job for me until I get a bite. Using circle hooks this can be really effective, but certainly takes away from some of the excitement of feeling the fish attack. When choosing your equipment for artificial lure fishing, there are several factors to consider. The species you are targeting, the environment you will be fishing and even the conditions of the weather. When tossing a lure for 8-12 hours a day, sometimes two or three days in a row it is a huge advantage to have a quality, light and balanced rod. 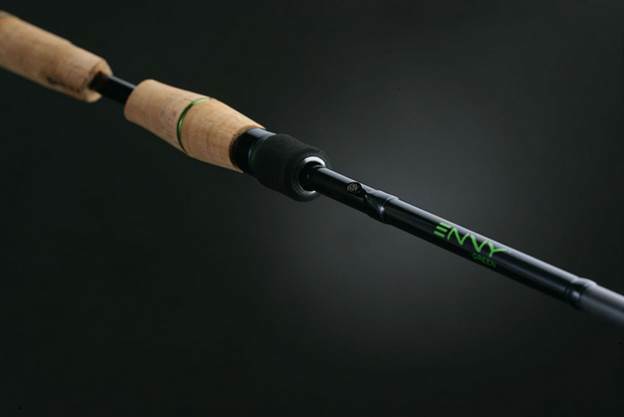 I was given the opportunity to test the new 13 Fishing “Envy” series rod. I chose the 7’2” Medium Heavy spinning rod (model #EGS72MH) as it is what I would use in most situations. With an MSRP of $270.00, it is in the middle to high class rod category for inshore spinning rods. My first impressions: When removing the rod from the plastic covering the first thing I notice is the matte black finish. It is smooth to the touch and looks and feels like a quality product. The next thing I notice is the custom cork grip. It has an aggressive design with sharp angled edges that separate the cork split grips. 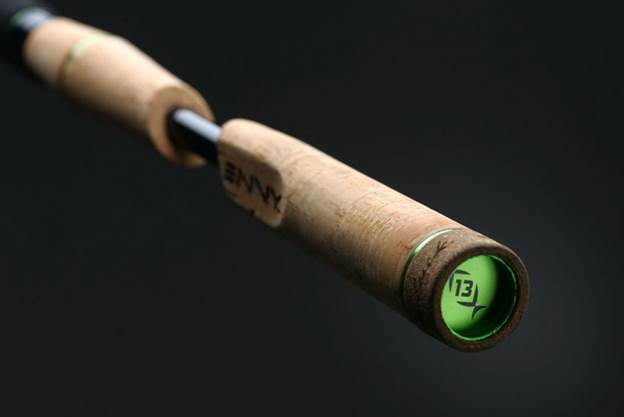 With bright green lettering and accent pieces the rod is very attractive and certainly catches your eye. I picked up the rod and right away could tell it was a quality product. It is extremely light, but still very firm. One noticeable benefit to this rod is the balance point. Most other rods are much heavier on the tip. Another feature I noticed is the tapered cork grip. The use a feature called “palm perfect” that uses an increased size in the middle of the grip and tapers off gradually. The idea is that the larger diameter will fit your palm entirely making it more comfortable to grip. While this may be true, it felt awkward to me as I am obviously used to smaller grips. Out on the water: It was a couple days and I got a chance to get on the water and use the rod. The rod pairs great with a 3000-4000 sized reel, I chose to use a Shimano Stradic Ci4 in the 3000 size. Using 10 lb braided line I tied on one of my favorite go-to lures, a ZMAN MinnowZ 3” swim bait with an 1/8 oz jig head. This is a common bait for me and something I knew I would be used to throwing. This is a lure I can fan cast across a flat and use as a search bait, but I can also cast to pot holes and site cast to moving fish. My first cast with this rod I was very impressed with the distance I was able to cast. The tip had more action than I expected, allowing for added distance. It was very sensitive and I could easily drop and twitch my bait through pot holes feeling every bump and peck from the chasing pinfish. After a few cast, I was hooked up with a good sized speckled trout. No monster, but a respectable slot fish in the 17-18 range. The rod felt great and I could tell there was a significant amount of backbone if needed. I was really hoping to find a larger redfish to test the stopping power of this rod but it was not meant to be that day. Looks great, attractive colors and styling. Very light with great action when casting or fighting fish. The hook keeper looks very nice, but was more difficult to use than a standard one. Overall I would certainly recommend these rods. They are light and sensitive in addition to using high end components that would generally cost you more from their competitors. If the Envy model price point is more than you’re comfortable with they also offer the “Omen” Series in the $100 price range. In addition to the quality of the product, 13 Fishing is owned and run by guys who are passionate about fishing and truly love what they do. If you’re in the market for a new rod, I highly recommend giving them a solid look.